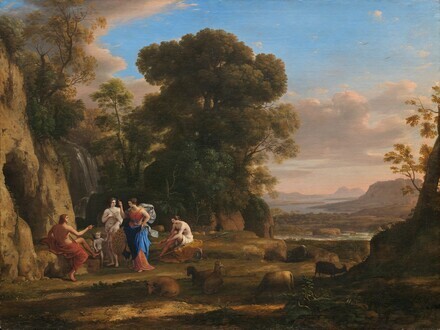 Like his compatriot Nicolas Poussin, Claude Lorrain forged his career in Rome. Claude's vision of the Roman countryside is grounded in a careful observation of nature, but he transformed the landscape into a timeless, idealized world through his masterful rendering of sunlight and strict structuring of space. The Judgment of Paris is one of the best known Greek myths. The goddess Strife threw a golden apple marked "to the fairest" amidst the gods and Jupiter selected Paris, a Trojan shepherd, to award it. Each goddess tried to influence Paris with a special gift. Minerva, depicted here with a spear at her side, offered him victory in war. Juno, attended by her regal peacock, offered to make him ruler of the world, while Venus, accompanied by Cupid, proposed the most beautiful woman in the world. Paris chose Venus who then led him to Helen of Sparta, which precipitated the Trojan War. Although the subject is suitable to history painting, the figures are relegated to the left-hand corner of the composition, making it clear that Claude's real interest was the landscape. The viewer's eye slowly moves from the tree in the extreme right foreground to the massive green trees in the middle ground. A winding river leads through the background until the mountains disappear in an atmospheric haze. Like Poussin, Claude has ordered nature -- here through parallel interlocked planes of space. Commissioned by François du Val, marquis de Fontenay-Mareuil [1594-1655], Rome and Paris. Le Danois, Paris, by c. 1740. Angran, vicomte de Fonspertuis, by 1747; (his sale, E.F. Gersaint, Paris, 4 March 1748 and days following, no. 426). purchased by Agard or Devins. Mr. [possibly W. or John] David, London; (his sales ["A Merchant of Respectability"], Christie's, London, 17 July 1819, no. 58, not sold, and 26-27 May 1820, 2nd day, no. 114); Urbino Pizzetta, London. acquired 1912 by the father of Miss V. Price, England; by inheritance to her; (sale, Sotheby's, London, 6 July 1966, no. 9); (Thos. Agnew & Sons, Ltd., London); sold 13 February 1969 to NGA. On the painting's early history, see Marcel Röthlisberger, "Claude Lorrain in the National Gallery of Art," Report and Studies in the History of Art 1969, and Marcel Röthlisberger, Claude Lorraine: The Paintings, Vol. 1, New Haven, 1961: 254-255, no. LV94. Le Danois is recorded in the second index of the the Liber Veritatis, c. 1720. See also the provenance supplied by the Thomas Agnew and Sons invoice of 24 March 1969 (in NGA curatorial files). Information about the 1819 and 1820 sales, and the purchaser in 1820, was provided by Lady Dorothy Lygon of Christie, Manson & Woods, letter of 21 September 1971 to J. Carter Brown (in NGA curatorial files). Pizzetta's collection was sold at Christie's on 15-16 April 1825, but the NGA painting was not listed in the catalogue, which identifies the seller as "Deceased." Claude Gellée dit Le Lorrain: 1600-1682, National Gallery of Art, Washington, D.C.; Galeries nationales du Grand Palais, Paris, 1982-1983, no. 34, repro. The Pastoral Landscape: The Legacy of Venice, The National Gallery of Art, Washington, D.C., 1988-1989, no. 53, fig. 99. Claude Lorrain - The Painter as Draftsman: Drawings from the British Museum, The Fine Arts Museums of San Francisco, California Palace of the Legion of Honor; Sterling and Francine Clark Art Institute, Williamstown; National Gallery of Art, Washington, D.C., 2006-2007, unnumbered catalogue, fig. 104. Smith, John. A Catalogue Raisonné of the Works of the Most Eminent Dutch, Flemish and French Painters. 9 vols. London, 1829-1842: 8(1837):241. Röthlisberger, Marcel. "Claude Lorrain in the National Gallery of Art." Studies in the History of Art (1969 - 1970):34-57, repro. Watson, Ross. The National Gallery of Art, Washington. New York, 1979: 73, pl. 59. Walker, John. National Gallery of Art, Washington. Rev. ed. New York, 1984: 310, no. 407, color repro. Whitfield, Clovis. "Claude and a Bolognese Revival." Studies in the History of Art vol. 14 (1984):83-91, repro. European Paintings: An Illustrated Catalogue. National Gallery of Art, Washington, 1985: 91, repro. National Gallery of Art, Washington. National Gallery of Art, Washington, 1992: 164, repro. Hand, John Oliver. National Gallery of Art: Master Paintings from the Collection. Washington and New York, 2004: 175, no. 136, color repro. Conisbee, Philip, et al. French Paintings of the Fifteenth through the Eighteenth Century. The Collections of the National Gallery of Art Systematic Catalogue. Washington, D.C., 2009: no. 20, 102-106, color repro.